Ladik city is located in the centre of Turkey, North of the city Konya. 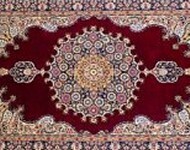 For centuries carpets are knotted and woven in this region. This area with many knotting areas in Turkey, is also called Anatolia. The Ladik carpets are known for their beautiful colours, wide main borders and separate alcove - and tulip motifs. An alcove motif is often called mihrab. People were knotting on small horizontal or vertical looms. The antique Ladik rugs have a wool warp and weft, often in colour. The pole is from wool and is highly refined. They used the Ghiordes knot. The later Ladik rugs have a wool or cotton warp and weft. The colours crab-red, corn blue, beige, golden yellow, sometimes black, brown and olive green are common colours in Ladik carpets. Some antique Ladik carpets look as if they were designed by an architect, with very refined colours and drawings. The antique Ladik carpets often have varied alcove motifs. In the main pattern of the carpet, instead of one alcove, there can be seen sometimes three combined alcoves. A large alcove in the centre and two smaller side-alcoves, supported by elegant columns. These columns are standing on large bases. The alcoves generally have a plain red, blue or beige coloured background. There are also alcoves in which a pattern is shown. There are several alcove variations. Sometimes with a bow - or a pointed arch motif, but also variants of up and down going roof-motives are distinguished. Sometimes the main pattern is divided in three sections. At the top or bottom of the alcove, there is a pattern of stylish tulips, often in odd numbers. Or patterns where on top of the alcove, ornaments in form of an oil lamp, lancet leaves, a flower bouquet or even combs are added as decoration. The edge of the carpet is often decorated with cartouches and various floral motifs. The main strip is surrounded by a smaller, sometimes with a floral-motive, secondary edge. Later the alcoves and columns are getting a simpler structure. The Ladik carpets than have one or three alcoves in form of a stylish staircase, sometimes decorated with small hook-motifs. The present Ladik carpets have complete different patterns and colours and are much larger. In many Turkish and international museums antique Ladik carpets and other antique Turkish carpets can be admired. The Rijksmuseum in Amsterdam shows a wonderful collection of antique carpets. World Famous 15th and 16th century painters often use images of beautiful Turkish carpets in their paintings. If you would like to look at more Ladik carpets please fill out our contact form. Van der Hulst Oriental Carpets can introduce you to the largest importers of oriental and Persian carpets.